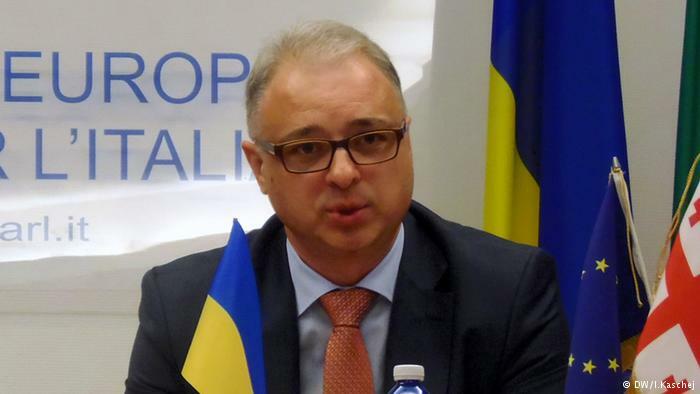 Ukraine's ambassador in Italy Yevhen Perelygin responded to the promise of Italian ultranationalists to lift the sanctions off Russia - due to the economic damage suffered by the local businessmen. This is mentioned ins the announcement by the press service of the Ukrainian Embassy in Italy. According to Perelygin, the statement about losses of Italian entrepreneurs is a 'manipulative one, taking into account the growth of Italy's foreign trade volumes over the past several years'. 'Trading with Moscow, lifting off the sanctions, means trading values that Ukrainians die for because of the aggressor country's actions', Perelygin added. He urged the so-called 'economic experts' not to deceive the Italian audience in respect of the reasons and consequences of the EU sanctions against Russia, imposed on it for the aggression against Ukraine. Matteo Salvini, the leader of Lega Nord ultranationalist party, who claims himself the only adequate candidate for the premiership in Italy, promised to lift the sanctions of the Kremlin. He shared the respective article, in which fellow Italian industrial workers urged the EU to call off the trade restrictions against Russia.